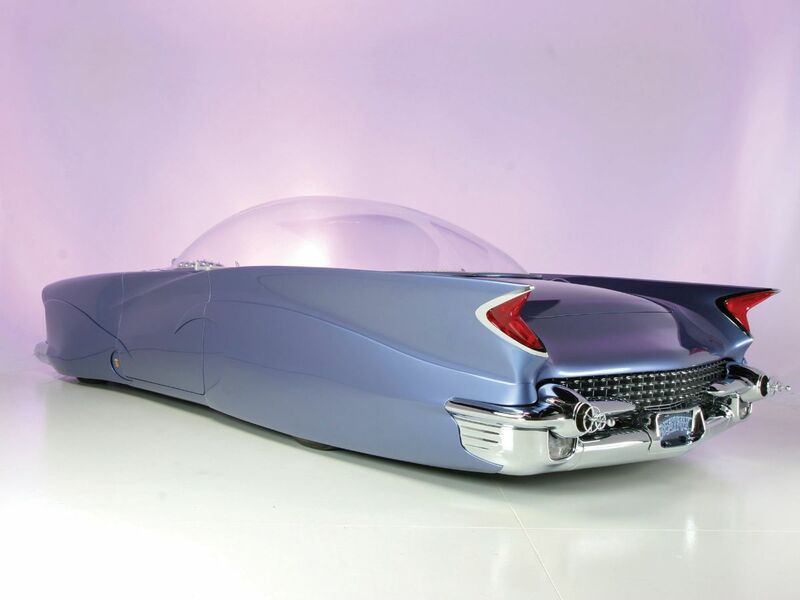 The builder of this amazing car was Gary “Chopit” Fioto, a New York custom car builder with a clearly eclectic moodboard. Fioto’s nickname, “Chopit,” craftily describes his central customizing philosophy. 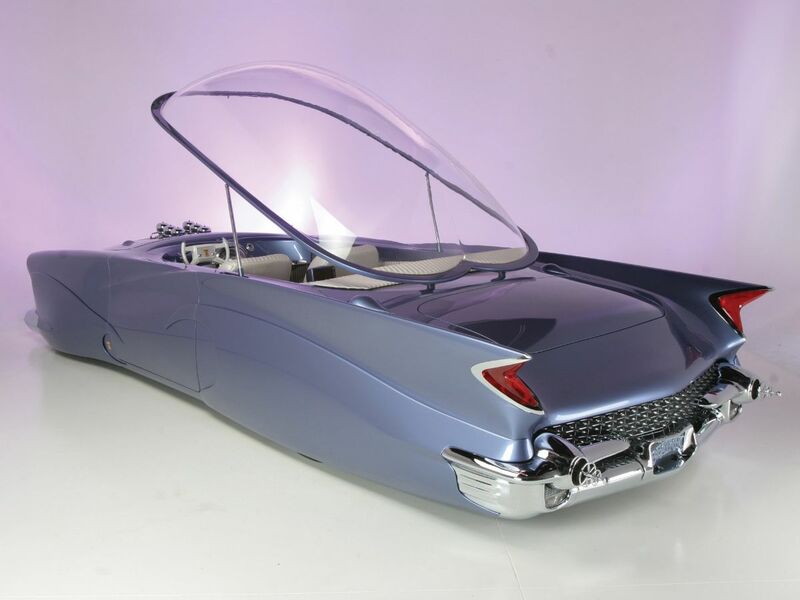 After he impressed custom-car traditionalists with his new interpretation on an old theme, a chopped ’50 Merc transformed into the sleek hardtop called “Tuf Enuff,” Gary Fioto performed his unique take on the Bubbletop genre. 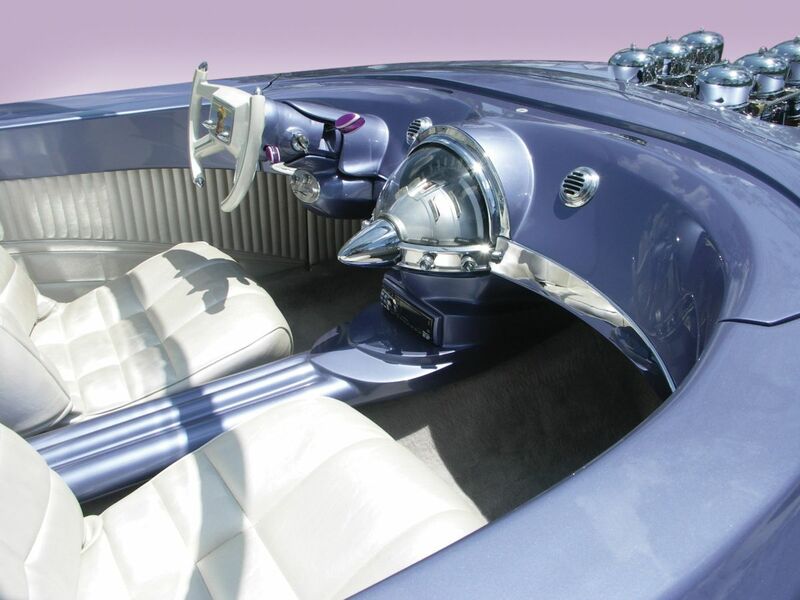 As per his style, he executed it’s design and build like no other: Fioto’s resulting effort, dubbed “Beatnik” after his car club, the famed “Beatniks,” is a lavender 1955 Ford-based custom he’s skillfully reworked into a Bubbletop. However, instead of lowering the roof of his donor ’55 Ford, he raised it, handcrafting the largest-ever Bubbletop custom. In 2006, “Beatnik” won the coveted $20,000 Grand Prize at Darryl Starbird’s National Rod and Custom Car Show, in Tulsa, Oklahoma. The win was a poetic one for Fioto, who read Starbird’s magazine feature articles as a youngster and chopped his first top at age 11. “Chopit” used aluminum detailing and a great deal of steel in the “Beatnik’s” construction. He’s immensely skilled in every car construction medium; he uses no written plans, and he thinks in three dimensions. 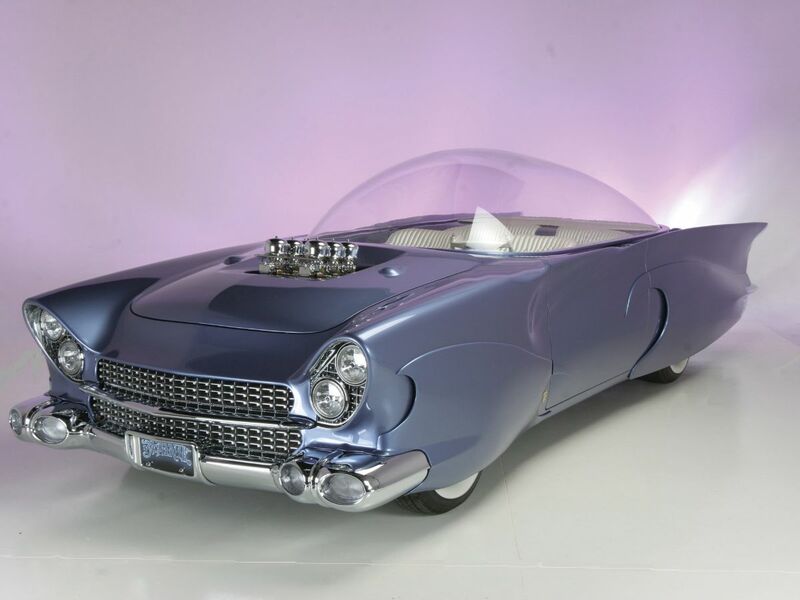 This one-of-a-kind, award-winning effort is simply stunning with its scooped, full teardrop skirts front and rear, pancaked hood, rolled and pleated pearl white Naugahyde interior and razor-like tailfins. The radical interior, complete with its aircraft control yoke-inspired steering wheel and bulbous dash pod, “Beatnik” is a wheeled tribute to the late 1950s and early 1960s – and it’s truly the work of an artist practicing his developed craft in the medium of metal. Look closely at “Beatnik” and you can see that movement – that is, if you can stop admiring the myriad details that make this car so interesting. This success hardly evolved overnight. “Beatnik” was an extensive, four-year project. “Chopit” started by completely removing the roof from a ’55 Ford. There’s not much left of the original Ford now. “Beatnik” rides on a modified ’88 Lincoln Town Car chassis. Fioto likes to replace ‘ancient’ running gear with newer components, reasoning that if there’s a mechanical problem, it’s easier to find late-model, rather than vintage, parts. 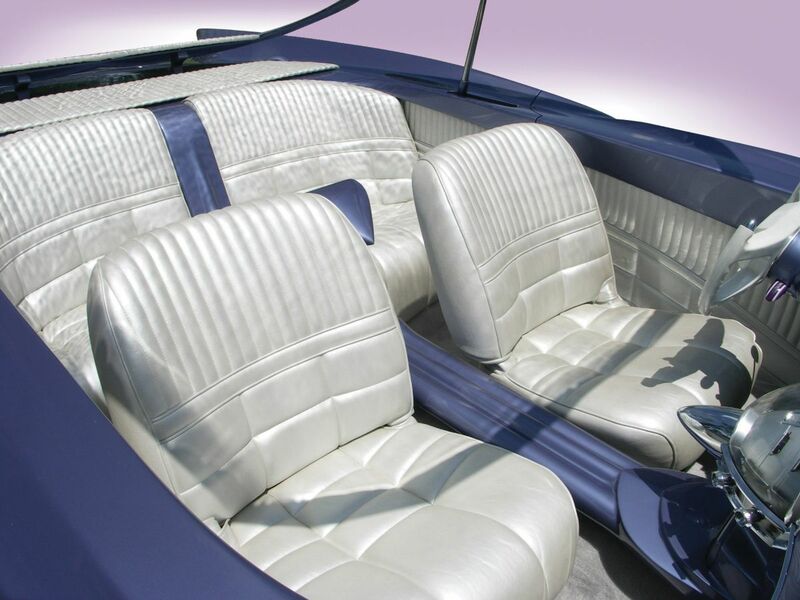 The “Beatnik” retains very few elements of the original ’55 Ford; if you look closely, you’ll note the cowl is still there, as are the insides of the doors and their hinges, the hood and its hinges, the trunk lock, and a few of the original trunk elements. The balance of the custom machine is hand-formed and custom-built. “Beatnik” is a truly exclusive custom and an inspired design statement that stands alone. Admired today, much like its talented builder, this extraordinary car will be even more highly respected in the future. It remains a fitting tribute to a creative era where a few imaginative builders tried to envision the future and succeeded in their own unique way. On August 19, 2015, the Beatnik rolled onto the block at the Monterey Sports and Classic Car Auction in Monterey, California, and sold for $360,000 plus commission.